In an era when touring bike options were limited, Von Dutch combined interesting parts from several machines, including a car and built his own. 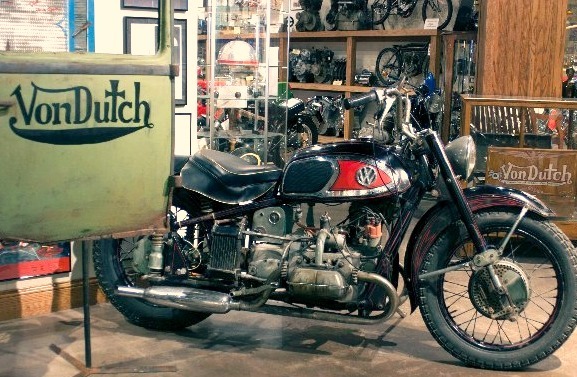 American Pickers co-host Mike Wolfe knew he was on to something good when he was given a tip as to the whereabouts of a very custom Von Dutch creation. 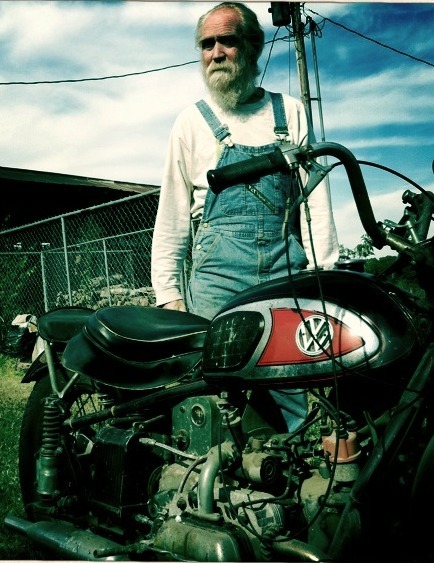 When he got to the bike the owner even had the pink slip in hand with Ed "Big Daddy" Roth's name as former owner! Now on display at the National Motorcycle Museum, Mike Wolfe's Antique Archeology owns a Von Dutch original, and an amazing machine it is! 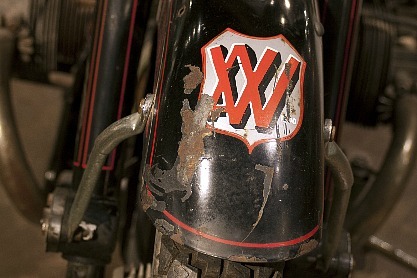 Looking at these photos you can see the XAVW is surrounded by many other interesting VonDutch creations and a few that honor the man all on display at the National Motorcycle Museum. Foretelling touring bike designs that would not hit for ten more years, Von Dutch created a smooth four cylinder machine with both Italian and German flare. The frame is from a military spec 1942 Harley-Davidson XA and has been stretched a bit to fit the crankcase of a 36 horsepower, 1200 Volkswagen engine. The engine is mated nicely to a an XA transmission, driveshaft and differential. Fork and fenders came from a 1951 Moto-Guzzi and the tank is from a mid-1960's Honda 450, the "Black Bomber" model. VonDutch designed and hand-painted a great "trademark" for his creation.